Just a bit more than a week before tens of thousands of people descend on U.S. Bank Stadium in Minneapolis for the Final Four, a dozen or so workers are putting up chain-link fencing across the street. In the plaza near the stadium, there are already several tents that contain walk-through metal detectors. Temporary security checkpoints have become a common part of the fan experience at big events. And security in and around stadiums is also a major consideration for host cities. But, as Minneapolis Mayor Jacob Frey put it: We got this. "From the X Games to the Super Bowl, to the baseball All-Star Game, to now the NCAA Final Four," he said, "we do these events. We do them with style." Frey and local law enforcement leaders recently unveiled a public safety campaign that will go into effect a few days before the games begin. Minneapolis Police Chief Medaria Arradondo said the overall security presence will be smaller than it was for the 2018 Super Bowl. For instance, there will be no National Guard soldiers stationed in the city. And the security perimeter around U.S. Bank Stadium will be less expansive, too. But Arradondo said officers from at least 30 city, state and federal law enforcement agencies will be part of the security team. And he encouraged everyone to follow the post-9/11 security mantra, "If you see something, say something." "We want to have our residents, our tourists, our visitors — we want them to be a force multiplier when it comes to the safety of our city," he said. "So, we are encouraging that. Situational awareness is very important." Visitors downtown will see not only uniformed police officers, sheriff's deputies and private security personnel, but a number of citizen safety workers as well. Shane Zahn, head of security for the Minneapolis Downtown Improvement District, offered a list of groups involved in the effort. "We work extensively with street outreach teams like St. Stephens, YouthLink, Youth Coordinating Board, MAD DADS, Mother's Love, many more on safety for everybody downtown," he said. Zahn added that members of the groups are out downtown, interacting with the homeless and at-risk youth on a regular basis, not just during the Final Four. It's not clear how much the security presence will cost taxpayers. Arradondo didn't have an estimate for Minneapolis police expenses. But he said the department's finance director will have that information after the games. Final Four host committee officials say they expect the event to bring in $148 million. However, revenue projections from past events like the Super Bowl have been hard to verify. 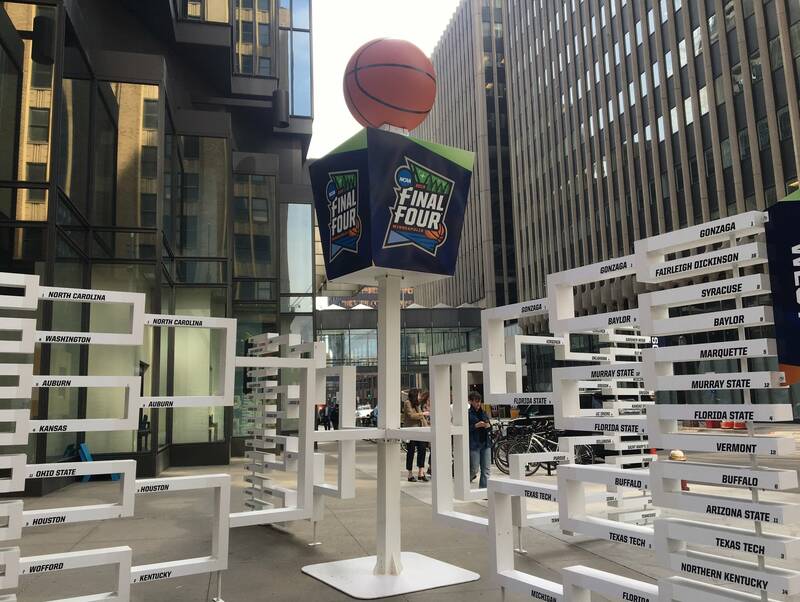 Steve Cramer, president and CEO of the Minneapolis Downtown Council, said downtown hotels and restaurants will reap a lot of the economic benefit from the Final Four. Cramer said hotels are booked and many hospitality businesses are hiring extra staff. He added that the council is helping some small businesses get in on the action. "We are sponsoring a pop-up retail activity in Gaviidae Common, called the Chameleon Consortium, which is 20-plus small businesses, mostly from Minneapolis neighborhoods — a lot of them from north Minneapolis — coming into the downtown market," he said. Nicollet Mall, the Convention Center and the Armory will host a variety of events. There will be concerts featuring national acts at the Armory; a festival for fans will be housed in the Convention Center; and a Ferris wheel will be erected on Nicollet Mall. Cramer said people who work downtown shouldn't face the kind of disruptions they experienced during the Super Bowl. Most of the major events will happen either during the weekend or after traditional work hours. However, city officials want people to be aware that road closures and restrictions around U.S. Bank Stadium have already started. And there'll be additional closures as game time approaches.